Why didn't Brian swing at Anglo boys as the economy went into a bunker? It's the curious case of the incurious Cowen. This case centres on a Taoiseach, who in July 2008 at the very point when the whole economic house of cards had begun to sway wildly, turned up for a game of golf with a group of Anglo bankers, and there was no conversation at all about what the hell was going on in an institution which was already in the wars. 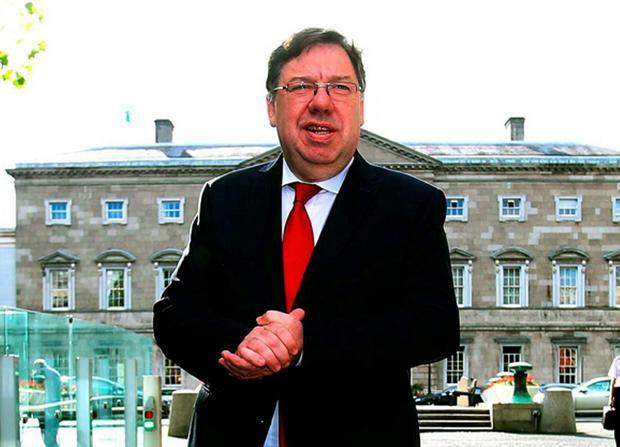 Brian Cowen was being quizzed by Pearse Doherty about the infamous outing in Druid's Glen with the starry likes of Anglo chairman Seanie FitzPatrick and sundry poohbahs from the bank. By this stage, piles of weeds were blowing into Seanie's rosey garden - Anglo's shares were on the slide, and concerns were mounting in financial and political circles over the extent of Sean Quinn's business with the bank. "Before you landed there, did you know that it was mainly Anglo individuals, either directors or the head of Anglo, that was going to be there?" asked Pearse. "To be honest, I didn't," replied Brian. Pearse, choosing his words with care, suggested that Brian's previous insistence that the parlous state of affairs at Anglo had never been discussed in Druid's Glen, when a coterie of bankers had the Taoiseach in their midst, "stretched credulity". He asked: "Can you confirm that no discussion on banking took place with these directors?" "You know, it's the truth - it was nothing to do with Anglo Irish Bank at all," he insisted. "If people want to have conspiracy theories about things, I can't help them with that sort of thinking," he said, before adding somewhat oddly, "As God is my witness, that's the truth". Later, while again defending his (in)actions to Kieran O'Donnell in relation to the same golf game, he declared his "integrity as a person" was being called into question. The incredulity wasn't sparked by conspiratorial theories of collusion between bankers and politicians - it was disbelief that a Taoiseach could display so little interest in finding out what was going on in Anglo when presented with the opportunity. It wasn't about his integrity as a person, but about his vigilance as captain of a ship. Because asking hard questions, and scanning the horizons for approaching storm clouds, and anticipating trouble before it turns up on the doorstep, are what leadership is about. Brian later admitted he had "underestimated" the impact on the nation of the IMF "coming to town". That, sadly, is the truth.